We are now halfway through our Email Server build, after you have rebooted your server you will be asked a number of questions that relate to how the server is configured. We recommend you use a strong password, such passwords which are considered strong are comprised of upper and lowercase characters along with numbers and symbols. However overly complicated passwords can be your downfall, if you can not remember the password you use you cannot access your server. So substitution can work rather well, here’s an example, you choose to use a password “Rover” only to find it consists of FIVE characters not EIGHT so you extend it by using “Oldrover”. Now we have the eight characters we need but this is still a dictionary word, although it must be stressed that as an admin password it may be accepted but as a user password it would not. (Strange that – It is often true that as a user, the passwords can be set to be cryptic and require regular change, but as an admin or root user account on the other hand passwords are changed very seldom and can be less cryptic – this can be due to internal policies or lazy administrators ). 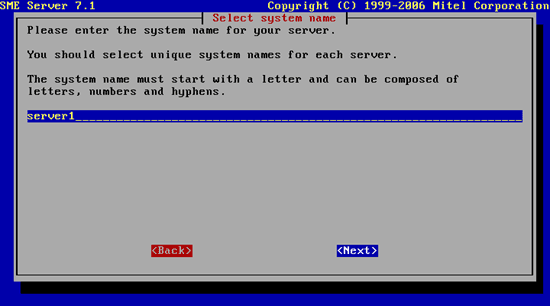 Next, once you have selected your admin password you need to enter the details of the domain name for the server, you may have a website with the same domain name but not to worry you can safely add the domain name component to this server as you will also be asked for a hostname later, this comprises part of your fully qualified domain name. 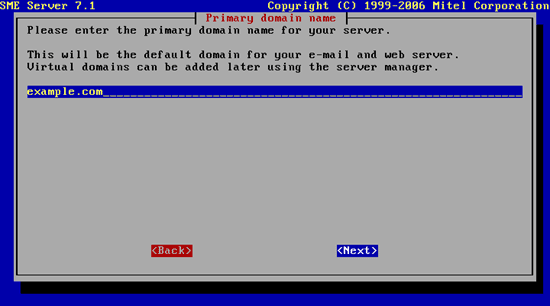 You are now requested for your hostname, you can call it anything you wish and if this is you first email server it is ok to call it “mail” if not then you could choose mail1, mail2, male, female and so on – so whatever you like really. When you make changes with the Mail eXchange records it is quite common to place a cname record called “mail.domainname.co.uk” where domainname is your own domain and a MX record pointing to the server IP Value this is your WAN address. Next you will be asked to define the local network address the simplist thing to do here is accept the defaults hope fully you have plugged the server into your local network and has picked up a suitable IP address obtained. 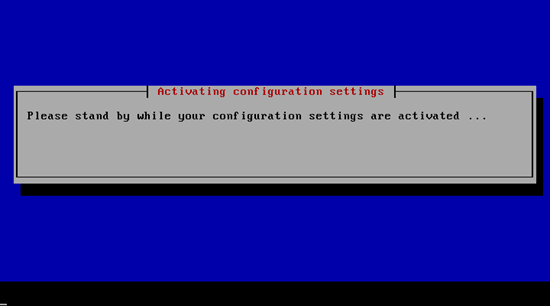 As this is a stand alone server build we do not use the local area network side of things anyway, you would need to install a second network card anyway. 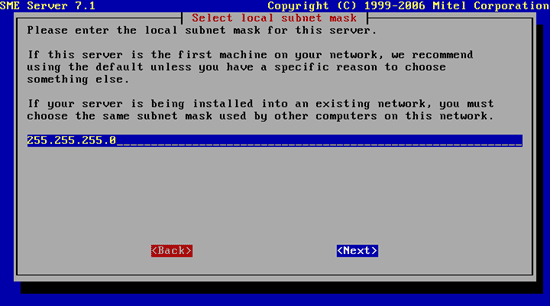 Confirm the network mask used by your local area network “LAN” this is usually “255.255.255.0” indicating 254 possible clients that can attach to the LAN. 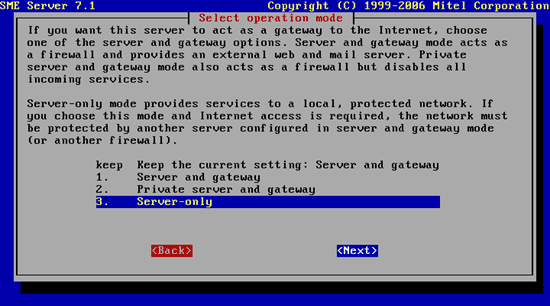 As you might expect at some point you will be asked if your server build is that of a Stand Alone Server or Gateway Server. Obviously you should choose to select “Server-only”. 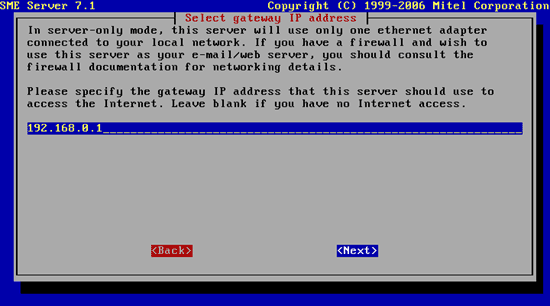 Here you need specify the IP address of your Gateway usually this would be picked up by DHCP as your network IP was if you are connected to your LAN, however you can safely ignore this request the Server build is that of a Server-only and as you do not have a second network card you cannot use this configuration. 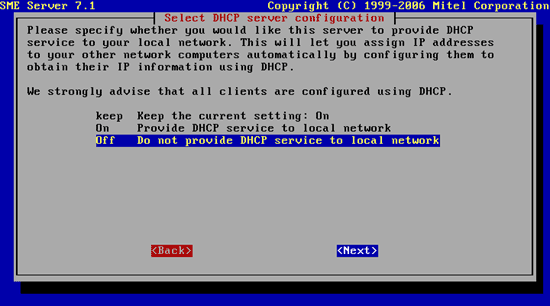 Just turn off the DHCP option for the same reasons as that stated above. 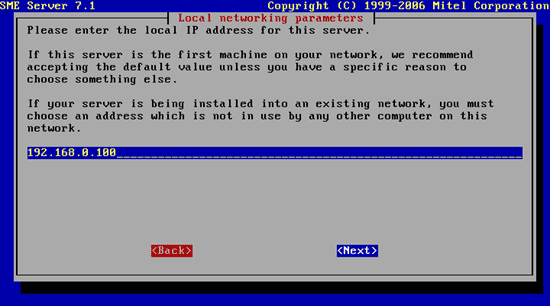 Leave this blank SME Server is smart enough to use the DNS servers defined by the router on the WAN side your network. 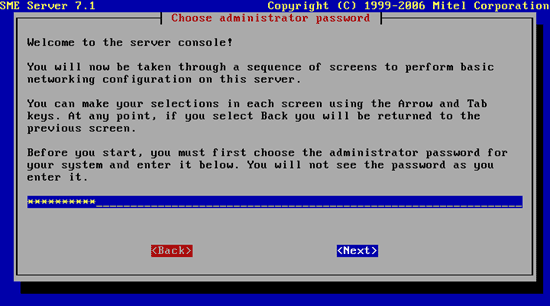 The “admin” account and the menu system it uses will allow you to access the systems Server-Manager to configure the server with new user email accounts and so forth. But for our purposes we will use Server-Manager accessed from the internet browser on a laptop or PC connected to your local area network. You may need some help from your ISP to configure your router correctly for the WAN IP addresses needed these would be available from what would be you Local Area Network ports on your router, often the ISP’s will send you a preconfigured router, BT whom we DO NOT recommend will provide the IP address range but not a preconfigured router, Andrews and Arnold do, and much more extras besides. Unfortunately whilst Andrews and Arnold are cheaper than BT, you are paying for a professional service, so you will find them more expensive than some domestic Internet service providers, however the choice is yours if you go with Andrews and Arnold you do get at least what you pay for.You will be asked a small number of questions during the build such as. 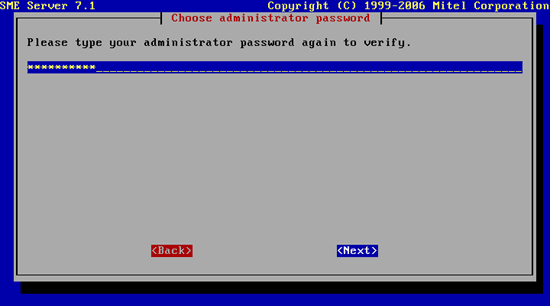 Choose your Administrator password for the server as this is a secure server you should choose a good rather than a simplistic password.